I've been looking forward to this strip for a long time. Story Time represents the start of our Western story that will be broken up and told in bits and pieces throughout the strip. Back when we first started doing Our Adventure Continues, the idea was that Harold and I were going to to a webcomic about two guys named Harold and Steeven, a writer and an artist, who do a webcomic. I mean, totally meta, right? 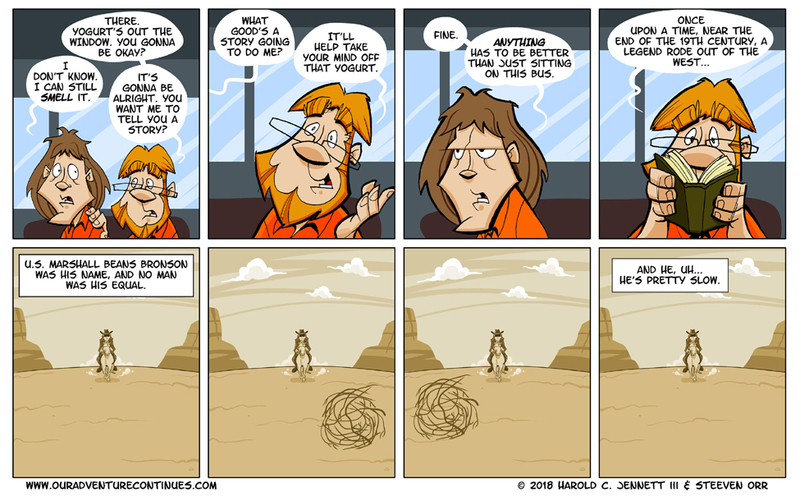 As part of this idea, we were going to have our characters create strips about all sorts of stuff, like a sprawling Western epic, in which the two guys play some of the parts, along with our supporting cast of characters such as Reg, Stan, Paul, and Gene (who are horses). In the end we got a way from that. If you've been following along you'll know that Harold and Steeven stopped working on the comic and went their separate ways. This caused them to wind up in prison together. Well, I'd had a number of strips written for this idea I'd had for a Western and I'm really excited that we found a way to fit them in. The Western is actually an homage to a movie that is not at all a Western. I invite you to guess which movie it is as you read along. I hope I haven't made it too obvious. Anyway for the next few weeks, enjoy Harold as Marshall Beans Bronson.